This is the chutney that goes well with almost all the South Indian snacks and tiffin items. Every home makes it with some minor changes to suit their taste buds.. Here is how I make it. 1. Grind the coconut, chana dal, ginger, green chillies adding a little salt and water to grind it. 2.Heat 1 tbsp. oil in a pan, fry all the ingredients and add the tempering to the chutney. Oh Really.. I am glad you saw it now. 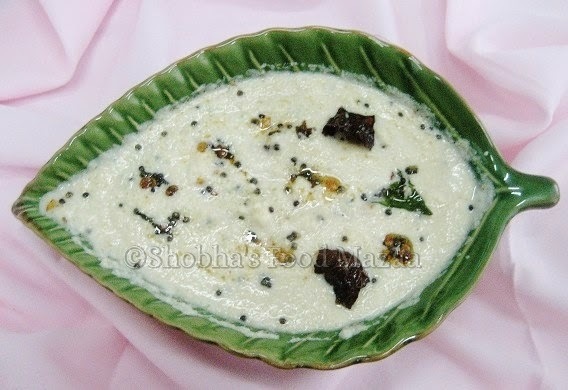 My all time favorite chutney with soft fluffy idlis.. Please collect the fabulous blog ribbon, waiting for you from my space.. Same here Divya.. idlis with chutney..Simply Divine ! yummy chutney.. perfect with dosa..
hi shobha.. i think there is some prob with net connection.. i am not able to see your recipes in feed..
my all time favorite chutney ..
What a lovely chutney so easy to make but delicious flavours.